Instant Pot Honey Garlic Chicken & 'Pot in Pot' Rice! 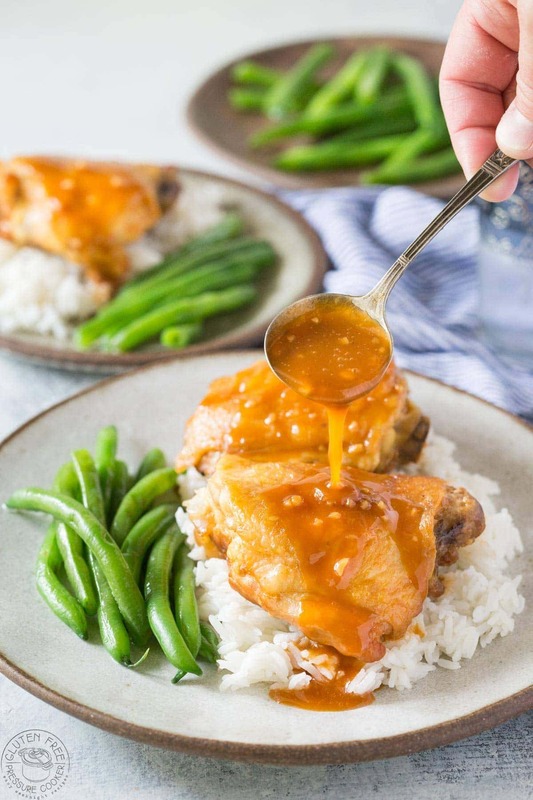 Instant Pot Honey Garlic Chicken is a fabulous recipe to make in your pressure cooker. The chicken cooks quickly and it’s really tender when it’s done. 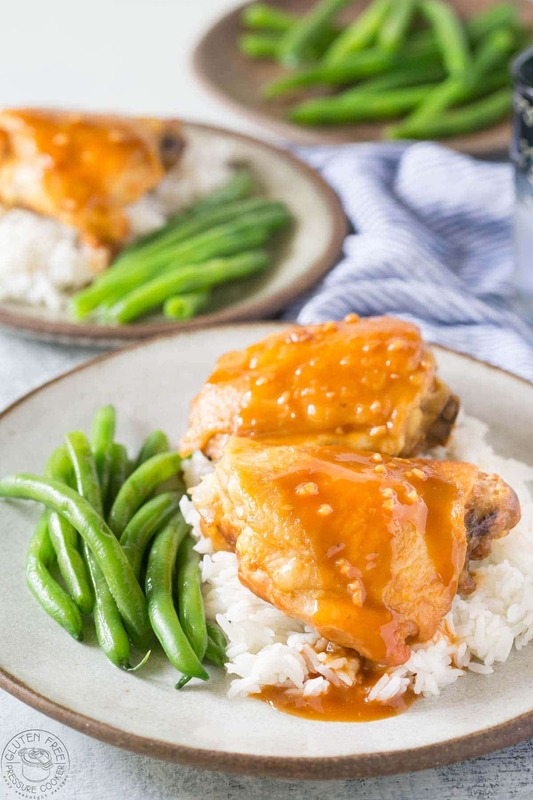 I’ve also added directions below to show you how to cook rice along with your Instant Pot Honey Garlic Chicken using the ‘pot in pot’ rice cooking method, which is really straightforward. I prefer to brown chicken thighs with skin on in a cast iron or other non stick skillet so that the skin does not stick to the base of the pot. 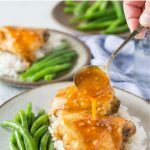 This recipe can be made Paleo really easily by simply substituting the Soy Sauce for Coconut Aminos, and using a paleo friendly starch such as arrowroot or tapioca to thicken it instead of cornstarch. The low sodium gluten free soy sauce is best for this recipe, I find the regular gluten free version can be overly salty. If you want to reheat your Instant Pot Honey Garlic Chicken just pop it in the microwave for a few minutes! ‘Pot in pot’ rice simply means that you are cooking rice in a smaller pot or container inside your pressure cooker. The main thing you need to know is how long the recipe cooks for at pressure to gauge whether you can cook the rice at the same time. To cook the rice like this you will need a long legged trivet so that your ‘pot’ can sit above the chicken. Then you’ll need an insert like this stainless steel stackable pot for the 6qt Instant Pot, or this Stainless Steel pot one for the 8 quart model. Then all you need to do is rinse your rice and add it to the steel pot and put the cover on. I used Basmati rice for this, but any long grain white rice will do. The water to rice ratio is about 1:1, so one cup of rice to one cup of water. I actually added an extra tablespoon of water per 1 cup/250mls water which I found made the rice texture a little better for me. I cooked two cups in my 6qt insert and it worked really well. 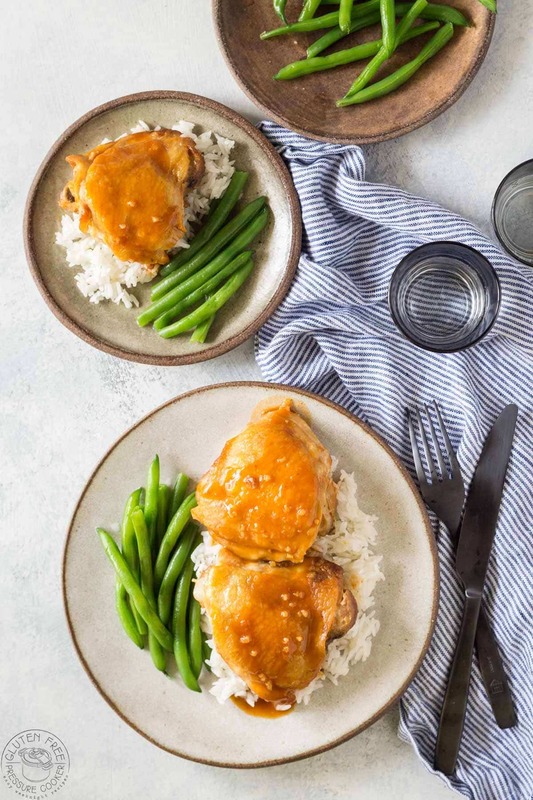 Easy Instant Pot Honey Garlic Chicken that is tender, tasty, and a recipe your whole family will love! Season chicken thighs with salt and pepper on all sides. Use the saute setting to brown both sides of the chicken, then remove from pot, or you might find it easier to brown them in a non stick pan. Cook for 8 minutes on high pressure, then let the pressure release naturally for 10 minutes and release remaining pressure and open the lid. Remove chicken and set aside. To thicken the sauce or add 1-2tbsp cornstarch mixed with cold water. Turn on the saute function if you need to, to reheat the sauce. Place a tall trivet over the chicken pieces and sauce in your electric pressure cooker. Add the two cups (not rice cups) of rinsed rice along with two cups of water to a stainless steel container suitable for cooking rice in a pressure cooker, and a little salt. I added an extra tablespoon of water per cup to make it a little softer. Cook the recipe as directed above. To make this recipe paleo simply substitute the soy sauce for coconut aminos, and use a paleo friendly starch such as arrowroot or tapioca in place of the cornstarch. This recipe was really easy and great! I made it with chicken thighs, but can it be made with chicken breasts? How would the cooking time change? I’m glad you liked it and it worked for you! If the chicken breasts are fat I’d cut them in half and cook for 6 minutes at high pressure and 10 Natural pressure release. Tasty recipe but in future makings I’m going to play with a little more spice. My sauce came out way way darker than what it appears in the picture – is tomato sauce really necessary? I almost forgot to put it in and sort of wish that I’d just ran with it. This is a great foundation for sure, I’ll definitely make it again. Hi Lisa, I’m glad you liked it. If you remove the tomato sauce you’ll need to replace that liquid with something else as it will require enough liquid to bring it to pressure.